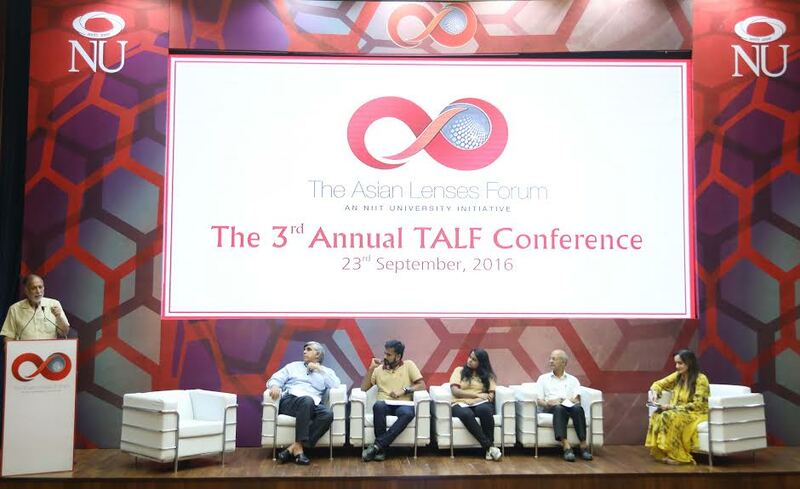 The Asian Lenses Forum is an outward-looking coalition of committed thought leaders, opinion makers and informed youth. TALF aims to create out of every Asian youngster today, a responsible global citizen with a confident sense of his own identity. As a platform it seeks to generate relevant knowledge and encourage multiple dialogues, engaging stakeholders across generations and nationalities. The 3rd TALF discussion on “How on Earth can we live together?” focused on the necessity of preparing the society to engage in constructive dialogue on intensely contentious matters. The students and faculty of NU from the Neemrana campus joined the thought provoking discussion through digital connection using ‘experimental classroom’ that was set up in 2014. The forum witnessed prominent speakers like Dr. Dinesh Singh, former Vice Chancellor, University of Delhi; Dr. Rajeev Sangal, Director of IIT (BHU); Nalini Singh, journalist, who is popularly known for anchoring the current affair program ‘Aankhon Dekhi’, sharing their views on fusion of civilizations and the social and economic changes associated with it. The conversation was anchored by Arun Maira, Management Consultant & Former Member, Planning Commission of India. Also present were Rajendra Pawar, Founder, NIIT University and members of the NU Board including Harpal Singh, Chairman Emeritus, Fortis. During the 19th and 20th centuries many of the Asian countries were colonized or otherwise subjugated by the West. The Asian mosaic of civilization was severely damaged, if not completely overwhelmed by Western imperialism. This dominance extended to every arena of economic, social and cultural life in a way that the Asian view of the world, and indeed of itself, got distorted by what one may call the Western Lens. Consequently, it would not be an overstatement to suggest that much of what Asians know of themselves is from the prism of western writers, historians and thinkers. However, since the turn of this century, one is witnessing the emergence of a new global reality: The Resurgence of Asia. Soft power in this context is an extension of a nation’s image abroad, but also a reflection of a nation’s domestic image and vision. What do Indians, especially young Indians, think it means to be Indian? How can the sought-after global soft power impact and influence domestic policies and national psychology? The two questions, what kind of role India aspires to globally and what kind of society does it aspire to nationally are interlinked. What are the values that should define India’s national and global identity? These questions lead yet again to the issue of the Asian Lens. India has to take leadership in ensuring that today, the world looks at the continent through new, Asian Lenses and understands the region through Asian eyes. NU realizes the need and importance of developing new and potentially superior understanding rather than creating a new body of knowledge that is parochial, self-centered and narrow. Asians and citizens from other geographies must, in the future, have the opportunity to “Know” about Asians from new and alternative lenses, as they reflect and think about what kind of future they would like to build for themselves and for the global community.